The life of a golf blogger is exciting! Exotic locations, high-end golf courses, golf babes, the best in golf equipment… When I’m traveling I use up a lot of power with my many cameras and mobile computing devices. Posting live blogs, social networking commentary, photos, and videos eats up a lot of juice. Plus I have golf GPS’s, bluetooth speakers, and all sorts of other devices I need to charge on the road. Sometimes I’m nowhere near a power outlet and that’s when MyCharge comes in. I’ve got many MyCharge units in my arsenal (see related links below). Now I have the mother of all portable chargers ready for its first gig, the MyCharge Portable Power Outlet. The Portable Power Outlet packs 20,000mAh of juice, a massive amount. 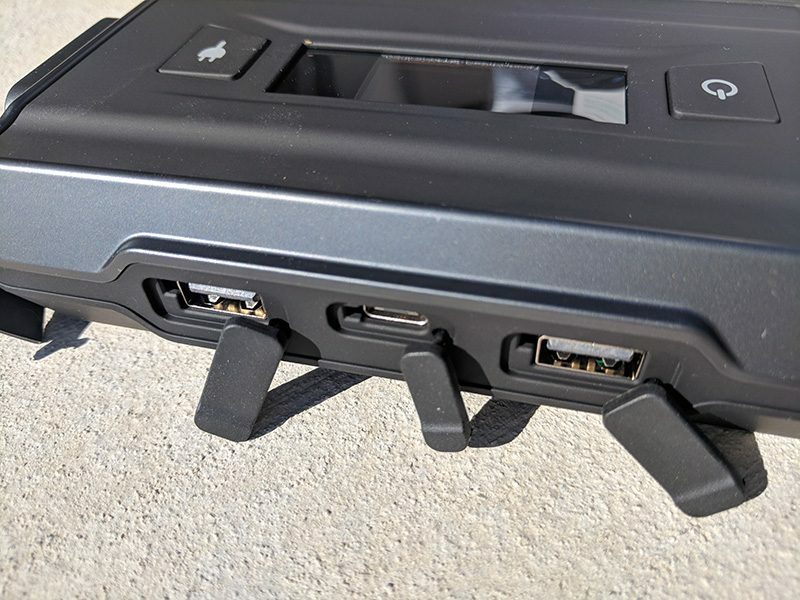 Through two USB ports, a USB-C port, and a 110 volt 65 watt power plug, I can charge up or run many devices at once, including laptops and items which require a wall plug. I’m about to take this monster on the road to Bandon Dunes, as well as the regular rigorous HOG golf blog schedule. I will post my full review and findings soon. Stay tuned, and stay charged! Whether golfing, exploring the outdoors, traveling, or just doing our daily routine, we rely on our mobile devices for communication, guidance, research, photos/videos and more. We all end up in a situation where we’re low on battery power and there’s nowhere to plugin and charge up. 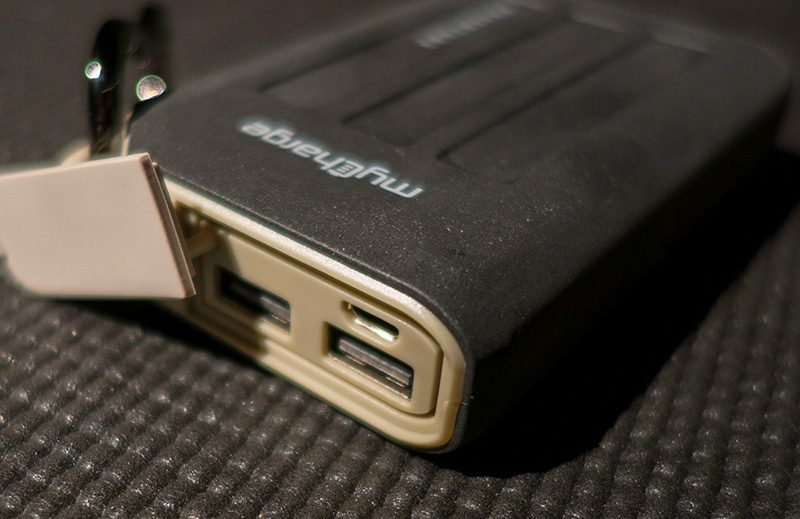 Enter MyCharge, maker of a large selection of portable chargers. 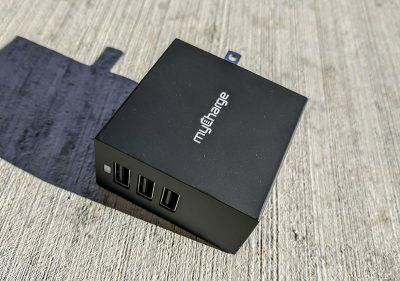 I’ve reviewed a few MyCharge units previously, check the links at the end of this review. Today we are looking at the AdventureMax rugged portable charger. 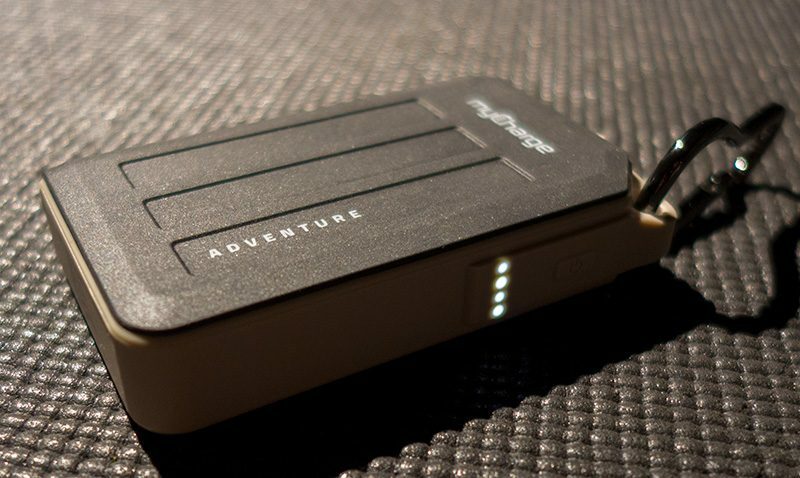 AdventureMax ($49.99) is a portable mobile charger with a battery capacity of 10500mAh. The internal 10500mAh Lithium Ion battery holds enough power to extend the battery life of a smartphone, tablet or other USB powered device up to six times. The unit offers two USB ports, allowing simultaneous charge of multiple USB devices and can even charge devices while it is being charged. With “Hyper-charge” the unit can charge devices up to 65% faster, and the unit charges up to 50% faster than other brands. The casing of the unit is rugged and includes a carabiner clip to hang it on bags, tents, backpacks etc. When I do my golf blogging and traveling I rely on a couple of USB devices, my Google Pixel phone and a small Sony pocket camera. Both charge via USB. I even use some golf GPS devices which charge via USB as well. I use the camera a ton when doing golf course reviews and golf travel reviews. On some golf press trips I’m away from wall power for 12+ hours. 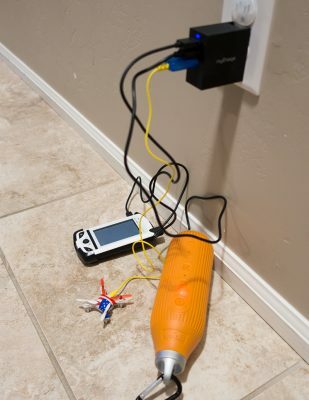 I rely on my MyCharge to keep my phone and camera charged so I can capture all the imagery and post social posts. 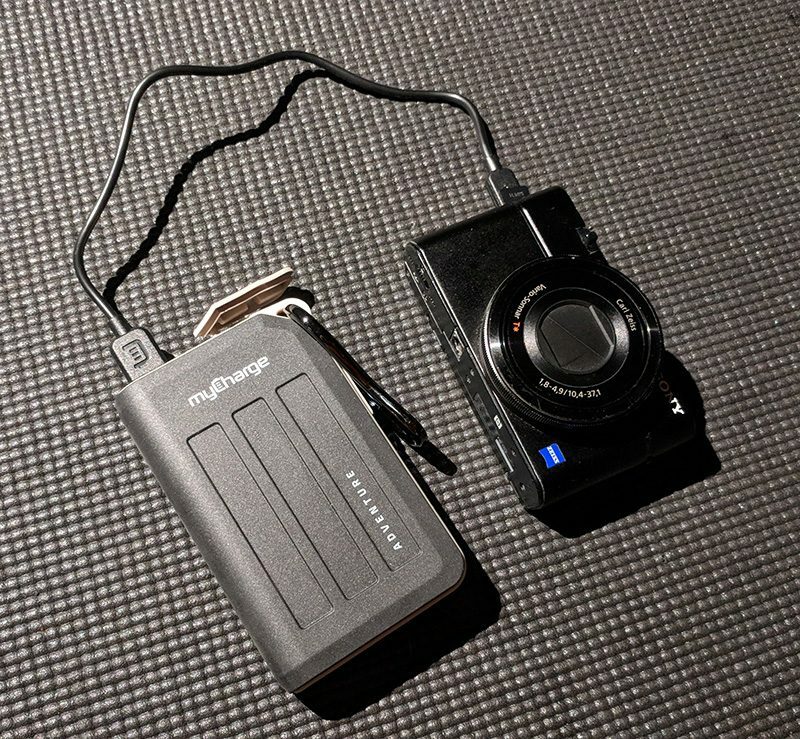 MyCharge makes great portable charging and USB accessories. My AdventureMax is invaluable for me on the road and it performs perfectly. Consider the AdventureMax as a great gift for Father’s Day, Christmas, birthdays and more. I’m in charge now. No, really. Thanks to my new myCharge Power-Base 3 I’m charging lots of toys at the same time. The most important toys of the moment include a golf GPS, bluetooth speaker, and of course a mini-drone about the size of a 50 cent piece. One wall socket, multiple items charging. Brilliant. 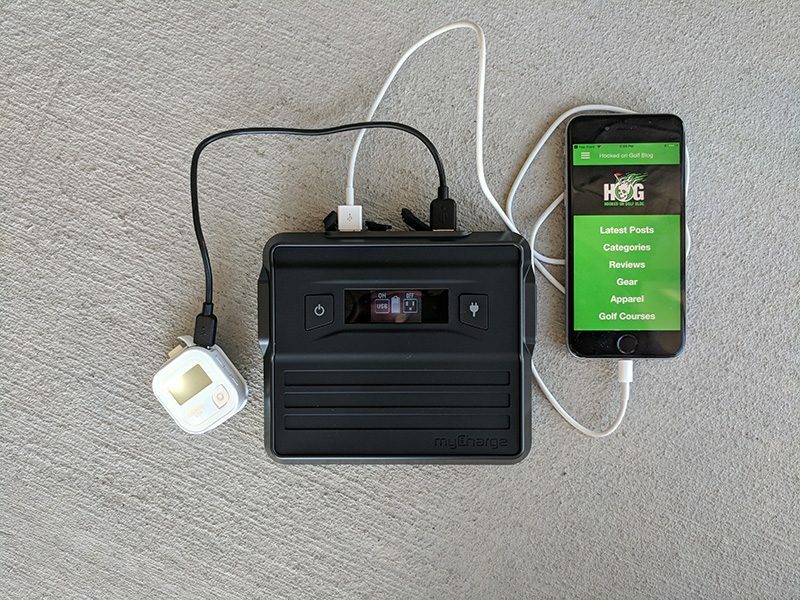 The myCharge Power-Base 3 is a 3-USB outlet charger for mobile phones, GPS’s, games, bluetooth devices; anything that uses USB for power or charging. The wall prongs conveniently fold in for easy storage when on the run. The unit puts out four amps of shared power. Plenty to charge most devices. From a golf standpoint the Power-Base three is great. I can keep one handy when I’m on the road because my camera, phone, and GPS devices all need USB power to charge. 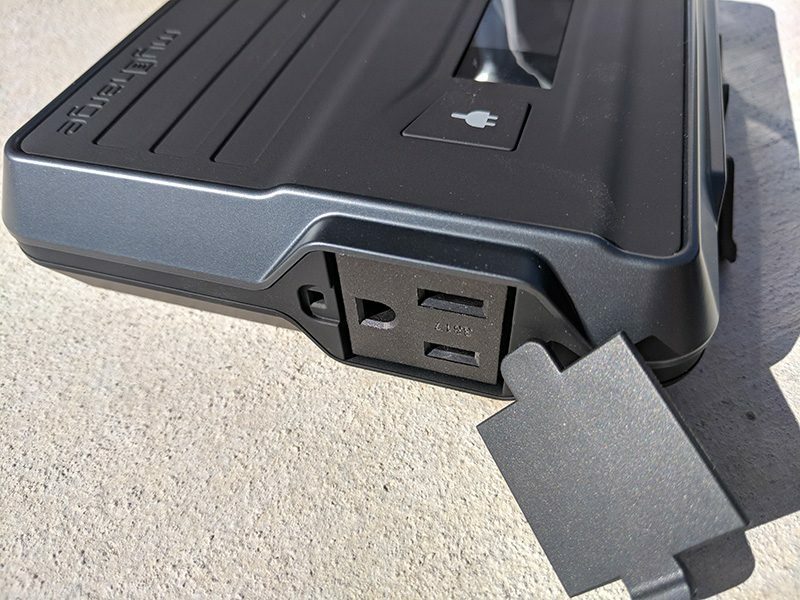 And when I know I’m not going to be by any outlets, I use a myCharge HubMax portable battery, or a new myCharge unit I’ll be reviewing very soon, the myCharge AllTerrain portable USB charger. I’d write more about the awesome myCharge Power-Base USB charging station, but it’s time to go listen to some heavy metal and fly my little copter around the Mrs. HOG’s head. Now I’ve got the power to do it. The question is if I have the power to deal with the consequences.